I enjoy a good kayak picture more than most, and there are some amazing shots out on the tubes, but I also feel it's important to disprove those shots that are fake when possible. As usual, someone beat me to it, but I had already done the "research" so here it is. Here's the picture making the rounds on the tubes, it's been around for years so you may already have seen it. 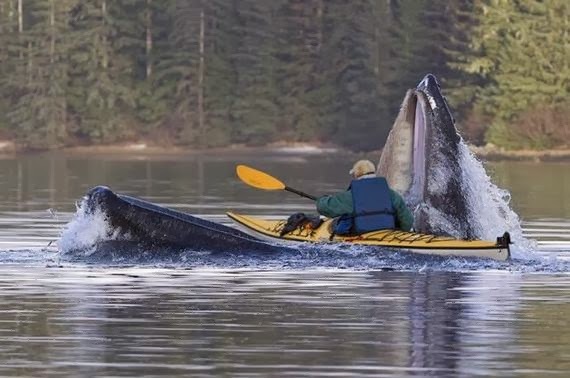 Yes, it appears a kayaker is about to be eaten by a whale, and no, it didn't happen. It's a pretty decent 'shop job though. The tiny image above is a thumbnail from the original photographers studio.